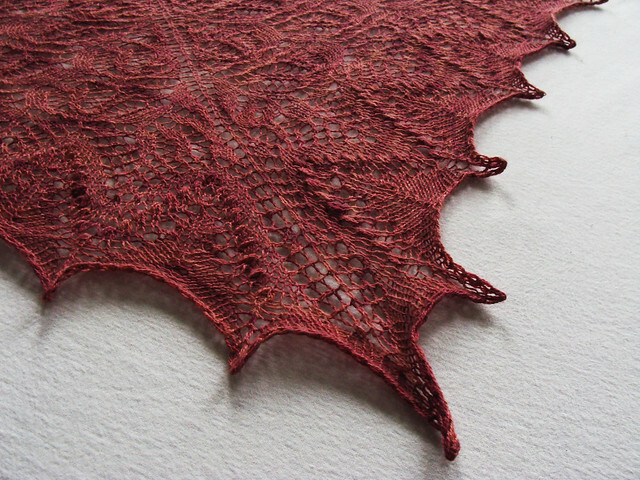 Marjorie is a shallow shawl that is perfect for that precious single skein of sock yarn. The solid stockinette body beautifully shows off subtle colour variations and the lace edging gives it an airy and pretty touch. Finally moved here from my previous blog, I present Percy. A shawlette with three different Estonian lace patterns. The middle chart is a little tricky because it is patterned on both sides, but if over 700 Ravellers did it, so could you! Do you always knit the first 3 stitches knitwise or do you knit on right side and purl on wrong side…? That ‘s not clear in you pattern… I’m giving it a try for the third time…. It ‘s sooo gorgeous. I just finished my Percy this evening and can’t wait to block it. It’s truly lovely! Thanks for the pattern. I wanted my Percy shawl to be a little larger, so I finished on row 31, purled the next row. Now I’m having a brain fart, and cannot figure how to get over to the pattern. Help!